So you’ve either just bought a ukulele or someone has bought one for you. You’ve given it a strum and it sounds pretty good doesn’t it? How the hell are you going to play a song though? The first thing you’re going to need to do is learn how to hold the thing! If you’re sitting down (which I’d recommend to begin with) then resting the uke on your knee works really well. If you prefer to play standing up then you actually need to support the uke against your body with your right arm while you’re playing. This can be quite tricky even for experienced players so you’ll often see people using a ukulele strap as a result. Initially I’d recommend that you work with just 3 chords. Those chords are C, F and G. The reasons for those chords are firstly, they’re fairly easy to play and secondly they’ll give you enough to be able to play hundreds of songs with. Concentrate on being able to play these chords clearly and also being able to switch between them quickly. Head this way if you’re not sure how to read the chord diagrams above. Look at the chord boxes above, the numbers in the red circles relate the fingers on your left hand (assuming that you’re right handed). So if we take the C chord as shown above, your 3rd finger should be pressing down on the 3rd fret of the first (bottom) string of your ukulele. Easy isn’t it? To begin with your fingers will hurt after a while, when that happens give yourself a break. Over time your fingers will toughen up and you won’t need to take a break. A good exercise to help you speed up your chord changes is setting a timer running for 60 seconds and switching between 2 chords, playing a single strum on each and seeing how many you can get in that 60 seconds. It sounds a little tedious but it is only 60 seconds and you’ll be amazed how much it helps. Strumming a ukulele is quite different to strumming a guitar. You actually want to be strumming only using your index finger, hitting with the nail for the down strums and with the fleshy part of your finger for the up strums. The area that you strum is a little different too. If you’ve played guitar at any point you’ll know that on an acoustic guitar you’re generally strumming somewhere near the sound hole. One a ukulele it’s more common to strum close to where the neck meets the body of the ukulele as you will get a better sound there (generally). Don’t worry too much about strumming with your index finger though, if you find something that’s more natural just go with that, it’s all about being comfortable. More information on beginners strumming patterns over here! So there’s 10 songs to get you going, but really you’re on the path to hundreds of others. By learning C, F and G you’ve learned the chord progression known as I-IV-V which is probably the most used chord progression in modern music. Practice whenever you can, there are no shortcuts, no-one gets good without putting in loads of time practicing. The best tip I ever read about practicing is to commit to just one minute per day. If you want to play on after 60 seconds has passed then by all means go for it, but always do the minute as a minimum. What you’ll find is that more often than not you’ll be enjoying what you’re playing and one minute will turn into 30 minutes. If you’re really dedicated, take a look at my recommended daily 20 minute practice schedule. 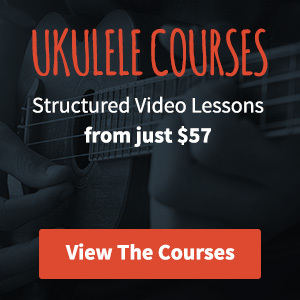 Hopefully that will help to get you moving with your ukulele.